At Lima Central Catholic, Jerry Cooper turned the Thunderbird program around and took the team to the postseason in his first year at the school. Somehow it sounds about right that Jerry Cooper’s dad drove a 7-Up truck for years. His son, like the beverage the older Cooper toted into grocery stores and carry outs, has never had any need to add caffeine. He supplies his own energy. In fact, he super sizes it. 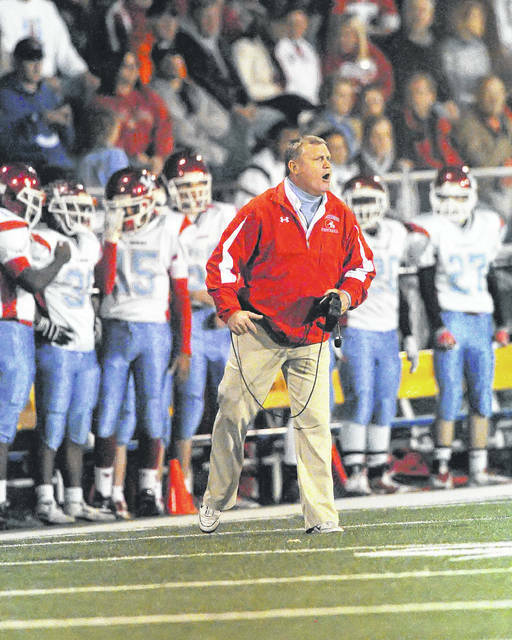 Cooper – who revitalized Lima Central Catholic’s football program and coached a state champion team at Columbus Grove – has brought that energy and passion to Shawnee, where he became head football coach in February. The hope at Shawnee is that he can recreate what he did at Bath, Columbus Grove and LCC, where those teams went to the playoffs 16 of the 21 years he was in charge. The probability is that there will be improvement at Shawnee. The certainty is that high school football will be more interesting with Cooper back in the area after four years of coaching in Tennessee. Some people might see a little bit of that in Cooper, too. He inspires his players and creates great loyalty in guys who have played for him. But some opponents might find his passion a bit irritating. “If you talk to the guys who played for me, they love that passion and competitive spirit. Very few players who have played for me will have anything other than that mindset about me,” Cooper said. “And that’s who I really care about, the kids in the locker room. Cooper grew up as the youngest of 10 children in his family in Mount Gilead in Morrow County. He got into coaching as a volunteer assistant at his high school after a knee injury during his freshman year of football at Otterbein University. He has been a head coach at seven Ohio schools and spent the last four years at Seymour (Tenn.) High School. His first head coaching job was at Waynesfield-Goshen in 1988 and he followed that with jobs in Hicksville, Lucas, Bath, Columbus Grove, and LCC before coming to Shawnee. His teams in Ohio have won 216 games and lost 73. In three years in Tennessee he got one team into the playoffs but overall his teams were an uncharacteristic 15-27. He resigned at Seymour in November after his teams there had records 2-8, 8-4, 5-5 and 0-10. The nine years he was at Lima Central Catholic did much to create his reputation as a program builder. 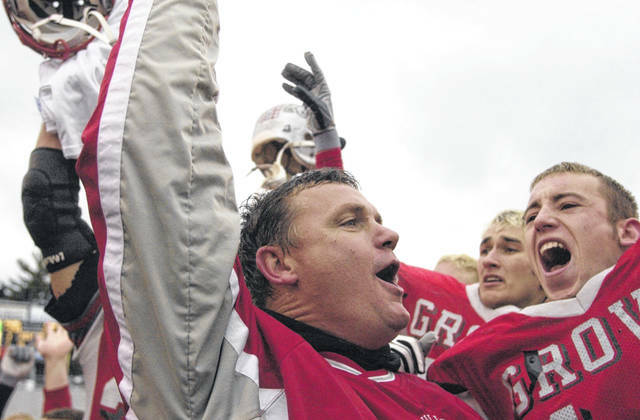 Bath and Columbus Grove both had been to the playoffs several times before he got there, but LCC hadn’t seen the playoffs in 15 seasons and had won two, three, four, two and four games in the previous five years when he was hired there in early 2005. The turnaround was immediate. LCC lost its first game in 2005 to Elida then ran off 11 straight wins before losing to Cincinnati Hills Christian Academy in the second round of the playoffs. “If somebody is going to flip a program around, he’s one of the best, especially around here, to do it,” said Aaron Link, the quarterback on the first Lima Central Catholic team Cooper coached. “He came in and was very energetic. That translates into his players. It just oozes off him and you can’t help but pick it up,” he said. “He knows how to reach kids with his positivity and his energy. “He loves the game, he loves coaching it and he loves being around the kids. It’s something you can tell right away when you meet him,” Link said. “I distinctly remember one practice where we were doing offense and we weren’t doing well. Nobody was really excited to be out there. Instead of getting upset and yelling and screaming and doing all that, which some coaches would do, he said this practice wasn’t starting out the right way so the only thing he wanted to do was flip the field. Tyler O’Connor, LCC’s quarterback from 2008-2011 before going to Michigan State, says Cooper is at the top of the list in at least one category. Attention to detail is another big part of the picture about Cooper, said O’Connor. “He always told us he wanted us to play mad, but he didn’t mean he wanted us to get mad. He wanted MAD – meticulous attention to detail. “Win or lose after our games, you could stop out at LCC at 1 a.m., and get a game tape to watch to see how you could improve. That was win or lose. He was always looking for ways to improve,” O’Connor said. That attention to detail is already evident at Shawnee. And there is another thread that would be familiar to former LCC players. Cooper got two of Shawnee’s top basketball players to come out for football, just as he reached out to athletes in other sports when he took over at LCC. Jarod Stolly was a junior during Cooper’s first season. He had played golf as a freshman and sophomore and was part of a class where as freshmen eight boys had tried out for the golf team and only six went out for football. Cooper approached him in a hallway at Lima Central Catholic one day and asked if he was interested in playing football. “I had played in junior high. I was pretty open to try it again,” said Stolly, who started two years as an offensive lineman at LCC, then played college football at Mount St. Joseph. The 2005 team’s success made the roster grow the next season. “The year after Coop’s first year we added probably 10 kids who wouldn’t have played if we hadn’t had that success,” Stolly said. “They had contacted me in a roundabout way the last three or four times the job was open but it had never fit. This time it just fit better. When they contacted me I obviously expressed some interest and we’re here,” he said. Now that he’s here again, the 59-year-old Cooper says he’s not going anywhere else any time soon. “My plan is to be the coach (at Shawnee) for the next five or six years,” he said.